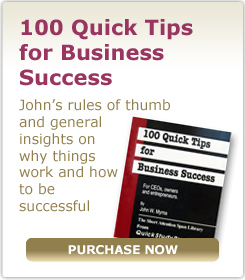 Following twenty years as a senior executive, John Myrna published 100 of his best tips for business success. - How does the 80/20 rule work in your business? - The CEO has only 3 jobs. What are they? - Why do you need fresh frogs? Frogs? ... See page 39. WINSTON CHURCHILL - To Table or not to Table. In his history of World War II, Winston Churchill records that differences in the interpretation of the verb "to table" caused an argument between British and American planners. The British wanted a matter tabled immediately because it was important, and the Americans insisted it should not be tabled at all because it was important. In British English, the term means "to discuss now" (the issue is brought to the table), whereas in American English it means "to defer" (the issue is left on the table to be resolved later). Never assume you're understood. Ask the other party to paraphrase what you said. I never cease to be amazed at how the simplest-seeming statement can be completely misunderstood. 5S is a formal process for achieving total organization, cleanliness, and standardization in the workplace. This results in a safer, more efficient, and more productive operation. It boosts the morale of the workers and promotes pride in their work, and ownership. Of course all of this is common sense. But as we all know, common sense is not common practice. Position the company for sustained future growth. For public companies, the price of a stock is based on value = EPS x PE_Ratio. EPS is earnings per share. The PE Ratio is the market's evaluation of future potential. It's the easiest thing in the world to increase profit -- just eliminate all sales and product development costs. For a while the company will show outstanding profit. However, without investing to position the company for growth over the long-term, you will not increase the company's actual value. Competence - do they know how to do the job? Do they have the skills and common sense consistent with their responsibilities/authority? Caring - do they care about your goals, needs, and objectives? Are their agendas aligned with yours? People don't care how much you know until they know how much you care. I only work with people I trust. Life's too short to do anything else. © 2019 Myrna Associates, Inc. All rights reserved.